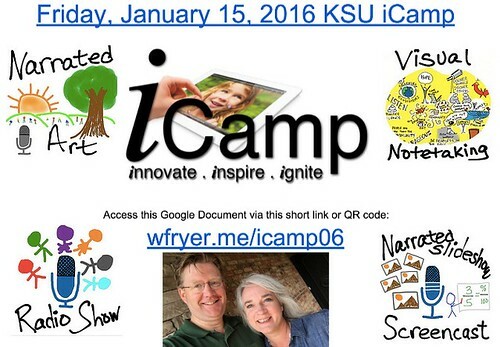 Join Shelly Fryer (@sfryer) and Wesley Fryer (@wfryer) on Friday, January 15, 2016, for iCamp iPad Day at Kansas State University in Manhattan, Kansas: A full day of hands-on learning about using iPads in the classroom! The day’s agenda, required and optional apps, and referenced resources are linked on the Google Doc available via wfryer.me/icamp06. Participants will create a variety of media projects using iPads which can be readily adapted for classroom use with students in a variety of content areas and grade levels. All the apps utilized for these projects are FREE! Registration (including lunch) is $50 and available online via KSU. Projects will be shared using the free Digital Portfolio app and platform SeeSaw, as well as via Twitter. Participants are encouraged to use the Twitter hashtag #iCampKSU to share their learning throughout the day. This 2.5 narrated slideshow video, created with Adobe Voice by Shelly and Wes, provides an overview of some of the core messages of iCamp 2016.